When I decided to follow-up about Manafort and Cohen, I believed the details emerging last Friday (the Manafort guilty plea and promise of cooperation with the Mueller investigation) would be fairly straightforward and easier to research than my previous piece. But there was much more to Manafort’s case than I expected. The players, the crimes, the consequences, etc. turned out to be mind boggling. Here’s the breakdown. To what crimes did Paul Manafort admit guilt? Manafort was convicted last month in Virginia on eight counts of tax and bank fraud, and he faces up to eighty years on those counts. Last Friday in Washington DC, Trump’s former campaign chair agreed to cooperate with Special Counsel Robert Mueller’s investigation and to lump all the charges together, with Mueller dismissing the original charges of failing to register as an agent of a foreign government and money laundering. Instead, Manafort pleaded guilty to conspiracy against the United States. He also admitted conspiracy to obstruct justice. Plus, Manafort confessed to the remaining ten counts of bank and tax fraud that were left hanging against him in Virginia case. These charges relate to his work as a lobbyist for a foreign government. This opens up doors into all sorts of political affairs that reach much farther than simple tax or bank fraud and well beyond Paul Manafort himself. There is no immediate relationship to President Trump. 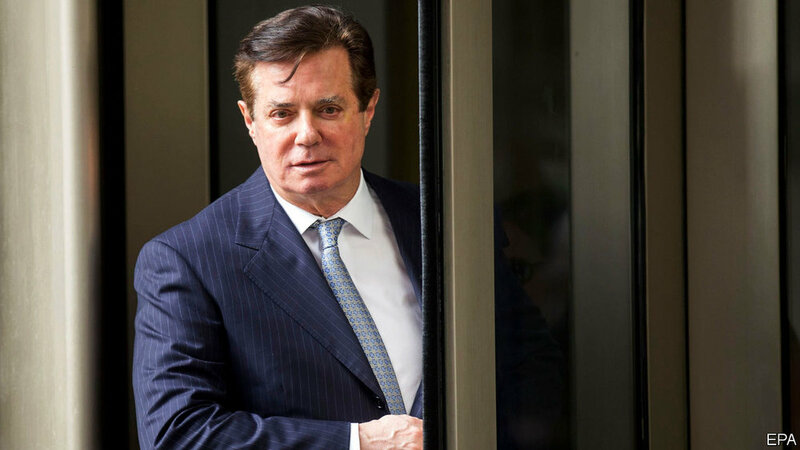 The majority of Manafort’s crimes took place before he joined the Trump team, and there is currently no indication that either Trump or his family are in any legal trouble due to the Manafort plea deal. Andrew McCarthy of the National Review thinks Manafort’s deal, if tied to Trump at all, would be for the purposes of obstruction of justice and nothing more. However, Manafort’s cooperation is what Trump may be worried about, since Manafort has now told Mueller’s team everything he knows that may implicate others in wrongdoing, including the president or his family. The treasure trove of information that Mueller can now extract from Manafort is summed up by Vox’s Andrew Prokop: A Seychelles meeting of a Trump donor and Russian fund manager; Roger Stone’s associates; Russian oligarchs; Trump’s digital operation; his inauguration; and possible obstruction of justice are all in play with the cooperation. Plus, Manafort has known Trump for decades, so there could be past transgressions the special counsel discovered when Manafort agreed to cooperate. But again, it may be nothing at all. Trump won’t take any major action before the midterms, as it would only make things worse for Republicans. There are reasons to believe that by avoiding a trial, including Manafort keeping the bad news for Trump to a minimum by keeping the trial and details from being reported on for weeks at a time. In some ways, this protects Trump from bad headlines in the midterms. Trump was livid over the media attention in the Manafort Virginia trial, so this is a win for him by avoiding a nasty press cycle that would accompany the trial for weeks. Unfortunately, that’s about the only good news for Republicans. Manafort was Trump’s campaign chair, and having him admit to conspiracy against the United States just sounds awful. I actually think Mueller was clever to get this charge announced this way, since to a layperson, it seems way worse than any bank or tax fraud, or even failing to register as an agent of a foreign government. When Trump’s campaign chair is guilty of conspiracy against the United States and conspiracy to obstruct justice, then dang. It sounds bad, and the guilt by association may linger for Trump and Republicans, perhaps diminishing them in the midterms. And we still don’t know the extent to which the cooperation may lead to more indictments. If you are asking about impeachment, then nope. Almost nobody is talking about it. At least, not because of Friday’s admission. Former federal prosecutor Doug Burns said on Fox News that impeachment talk was not coming from this particular plea. But he added that while the plea has nothing to do with the president, we don’t know yet what the cooperation will lead to. What is Trump’s position on Manafort cooperating? The president has been unusually silent about Manafort since Friday. As you recall, Trump praised Manafort for not flipping after his guilty verdicts in Virginia, so this cooperation came as a bit of a surprise. One thing I should mention is that it’s in Trump’s best interest to distance himself from Manafort at this time. Trump did the opposite after the first trial, but with the latest admission of guilt, there’s a new light shining on just how dirty Manafort’s crimes were. I’ve done enough research, and I’ll demonstrate that below, that hearing the President of the United States proclaim Paul Manafort “happens to be a very good person” makes my blood boil. Manafort a very good person? No. Grifter’s gonna grift. And that’s the mildest thing you’ll read from me about Paul Manafort. A pardon serves neither party. For Trump, he can still pardon Manafort. Though he’d hinted previously that he might, it makes little sense now that Manafort has already spilled the beans. A pardon would be too little too late at preventing Manafort from dishing any dirt on Trump, his family, or the campaign. Trump respects loyalty above all else, and hearing that Manafort is cooperating with the investigation will most likely sour Trump on the idea of a pardon. Plus, any pardon would be politically damaging. There’s no world in which a pardon helps Trump or Republicans, and there are many reasons to believe a pardon would cause lasting damage. Even Trump’s ally Alan Derschowitz thinks a pardon is a bad idea at this point, especially now that Manafort’s crimes are conspiracy against the United States. Appearance wise, that can’t be a good crime to pardon. A pardon also wouldn’t help Manafort escape prison. Nick Akerman, the former Watergate prosecutor, explained in Politico that a presidential pardon will not stop Manafort from going to jail since Manafort’s confession can be used against him in state court and the president cannot pardon state crimes. Mueller is crafty. He’s also a bit lucky. Remember that lone juror who was the holdout in ten of the charges in Virginia (how silly must they feel now that Manafort confessed to all those crimes)? As it turns out, those counts of a hung jury did more harm than good for Manafort. Check this out. Mueller attached admitting guilt to those crimes as a condition of Manafort’s cooperation, which means by the jury notfinding guilt on those counts and Mueller later able to get Manafort to openly admit to them, those crimes can now be transferred into state charges by using Manafort’s admission as evidence. It would have been better, for a possible pardon anyway, if the jury had simply found Manafort guilty on all eighteen charges in Virginia. What does this deal mean for Manafort? By deciding to cooperate, Manafort is hoping to get less than a life sentence in jail. Some legal experts predict that he may get a total of around ten years behind bars. Manafort has also agreed to give up roughly $50 million in cash and properties, and he will receive no compensation for telling his story in the future. I think Mueller is mostly done with him for now. Although the special counsel may have more questions in the future, and Congress may want Manafort to testify, Mueller has already conducted several days of talks with him, so he might have all the information needed to proceed in his investigation. Manafort has to wait for sentencing in Virginia and DC, at which time he will surely go to prison. What does this guilty admission mean about Paul Manafort, the person? Manafort is a bad man. It’s time to stop playing softball with Trump’s former campaign chair. As summed up in the headline of the Daily Beast, “this is way beyond money laundering.” The victims are often left out as we read the dispassionate lines about “lobbying as an agent for a foreign government without registering” (the original charges), as if simply registering as an agent would have made it legal and changed nothing. That’s the wrong interpretation. After all, it’s harder to get hustled if you know you’re being hustled. Had Manafort not committed those crimes and had he registered as working for Ukraine, then perhaps his damage could have been limited. Instead, here is what we know. Let me begin by saying this: Manafort did not commit victimless crimes. He illegally lobbied on behalf of a pro-Russian corrupt and repressive leader in the Ukraine, Viktor Yanukovych (more on him below). And this illegal lobbying may have played a role in several outcomes that are nothing short of treacherous. One of Manafort’s victims was the former Prime Minister of Ukraine, Yulia Tymoshenko. In 2005, Forbes named her as the thirdmost powerful woman in the world. Luke Harding at the Guardian spelled out how Paul Manafort’s illegal lobbying helped keep her wrongly imprisoned for over two years. Tymoshenko was the primary opposition to Yanukovych, and after he defeated her in the 2010 election, his government went about framing her for crimes as punishment for her opposition. She was wrongly imprisoned from the end of 2011 for more than two years until 2014. The judge who sentenced her fled the country and was subsequently placed on a wanted list, after being charged with “giving a deliberately unlawful verdict.” The Ukrainian Supreme Court has since cleared Tymoshenko of all charges, but it didn’t stop Yanukovych from railroading her, thanks in part to Paul Manafort. Manafort was working for Yanukovych in secret. In this capacity, Manafort hired two PR firms, Mercury Public Affairs and the Podesta Group. They worked in conjunction with law firm Skadden, Arps, Slate, Meagher, and Flom to lobby the United States government on behalf of Viktor Yanukovych’s government. Manafort set up a several different nonprofit shell companies to hide the fact that all these groups were working for the Ukrainian government. This matters because after Yanukovych kangaroo courted Tymoshenko behind bars, it was Manafort’s job to persuade the United States government, through the Skadden report, to believe this sham of a document (which Manafort was paid millions of dollars to spread): That the trial and Tymoshenko’s imprisonment was lawful and not political. But that was a lie. The United States was looking to punish, sanction, or pressure Ukraine if the trial was discovered to be political and unjustified. Unfortunately, Manafort’s lobbying efforts paid off with meetings across the board with government officials all the way up to the White House. All the while, Yulia Tymoshenko sat in prison and the United States took no decisive action on her behalf. A powerful woman, often on hunger strikes, rotted away in prison because Paul Manafort’s hand was heavy on the scales of injustice. The “lock her up” analogy is too close to home to ignore. It’s not a harmless chant about a political opponent; it’s real and has been used against a powerful woman to do very immoral deeds. Tymoshenko is not Manafort’s only victim. The Ukrainian people suffered under the corrupt leadership of Yanukovych, and Manafort was a key player in this tyrant’s election and subsequent actions. Andrea was most likely referring to her father’s role in influencing Yanukovych’s actions, and not any direct murders, but the gravity of those texts should not be ignored. Ukraine, its people, and its future are also victims of Manafort’s dirty campaign. He helped shape American foreign policy. Yanukovych and his cronies stole over $100 billion from the people of Ukraine, but Yanukovych’s crimes became much worse when it was discovered that some of this stolen money has been used to help back Russian separatists in the East Ukraine fighting. Since Yanukovych fled to Russia, many of his crimes have come to light, and he’s currently charged with treason, complicity in a war against Ukraine, and activities aimed at altering Ukraine’s state borders. All the while, Manafort illegally lobbied the United States to do nothing. Remember, Russia soon invaded Ukrainian territory on more than one occasion following these events, both seizing the Crimean Peninsula and began a still-ongoing war in easternUkraine that’s killed more than ten thousand people to date. Did Putin feel emboldened due to the lack of action on the part of the United States when we failed to defend the former Ukraine Prime Minister, Yulia Tymoshenko? It’s naïve to think US inaction didn’t play a role in Russian planning. After all, the annexation of Crimea happened in early 2014, around the same time Russia was extracting Yanukovych back to the homeland. Manafort’s lobbying, as well as the sham report written by Skadden, was an important part of the United States reaction to placating Yanukovych and his Russian allies. The United States’ soft response, in part due to Manafort’s lobbying, was almost certainly a factor in Russia’s decision to invade Ukrainian territory. We are now at 10,000 deaths and counting. Manafort is not an innocent man who was treated unfairly. It took lead prosecutor Andrew Weissmann thirty minutes to list all the crimes he pleaded guilty to. Thirty minutes. And it concluded with the judge calling it “probably the longest and most detailed summary” she’d ever heard, this column notwithstanding. Democrats. Republicans. Foreigners. Russians. Oligarchs. Big-time law firms. Fake nonprofit companies. Other sketchy lobbyists. I’ll try to keep this section as simple as possible, but when researching all the other players involved with Manafort, my head was spinning. Trump got one thing right for sure. DC is a swamp, and that’s an understatement. Mercury Public Affairs and their front man, Vin Weber (former Republican representative from Minnesota). The Podesta Group and their front man, Tony Podesta (Democratic lobbyist and brother to John Podesta, the chair of Hillary Clinton’s presidential bid). Both Mercury and Podesta received more than $2 million from Manafort’s shell companies. The law firm Skadden, Arps, Slate, Meagher, and Flom and their front man, Greg Craig (Democratic power broker, White House Counsel under Obama, and led Bill Clinton’s team against impeachment). Skadden was paid nearly $5 million from Manafort’s offshore accounts to produce the misleading report about the trial and imprisonment of former Prime Minister Yulia Tymoshenko. Oh, but Skadden claimed to only be paid $12 thousand, because otherwise their work would have gone up for a public bid. So they were really paid $5 million, but claimed a meager $12 thousand. Go figure. All three worked with Manafort and most did not register as agents for foreign governments, just like Manafort, so they could be in hot water. Mueller gave these cases to the Southern District of New York to investigate. They may not have committed wrongdoing, but it looks bad. Their activity could be investigated separately or together. It is not clear yet. What they all have in common is lobbying for Ukraine. Mueller is being careful and farming out anything he can to other prosecutors to investigate. It is possible that all the above people and companies were duped by Manafort and Rick Gates (Manafort’s deputy campaign chair for Trump who has already pleaded guilty to conspiracy against the United States), and if so, then they may not be in any legal trouble. However, some reports doubt this defense. The European Center for a Modern Ukraine. This was the nonprofit fake company Manafort set up on behalf of Yanukovych to avoid the appearance of working on behalf of a foreign government. Manafort and Gates paid both the Podesta Group and Mercury through the ECFMU. Another fake thinktank called Center for the Study of Former Soviet Socialist Republics that lobbyist Alan Friedman published through and was financed by Manafort. They ran articles on RedState.com and even ghostwrote an article by Yanukovych published in the Wall Street Journal. Other sketchy lobbyists. Alan Friedman (mentioned above), and Eckart Sager. Friedman was a former Wall Street Journal reporter and Sager a former CNN producer, and this experience probably helped them with their propaganda. They helped Manafort plant stories and ghostwrite pro Ukraine opinion editorials. Friedman was paid 700,000 Euros by Manafort to actually accuse Tymoshenko of financing a murder and plant that story in American media sources with “no fingerprints” leading back to them. Random Russians. Konstantin Kilimnik was Manafort’s Kiev office manager who had ties to the Russian GRU spy agency. This is who Manafort obstructed justice with when Manafort reached out to him to coordinate his testimony. Then there’s German Kahn (the Russian oligarch) who is the father in law to (and may have influenced the crimes of) Alex van der Zwaan (the Skadden attorney who pleaded guilty to lying to federal agents). The last Russian for today’s hodgepodge is Oleg Deripaska. He’s the Russian oligarch Manafort owed money to and Deripaska could have influenced Manafort directly on behalf of Russia (collusion) therefore influencing Trump’s Russia policies. Simply put, Manafort could have acted for Russia, either through desire or blackmail. I’m having trouble keeping track of all the people and companies involved. Is there a cheat sheet handy? Hopefully you vaguely remember their names if it becomes an issue down the road. Don’t worry, I’ll be here for you when and if it does. For now, don’t even try. What does this mean about the Mueller investigation? Mueller is golden. His team is rock solid. Trump’s line about 17 angry Democrats and a witch hunt is getting old and tired, and these new guilty pleas demonstrate that. Indeed, Manafort’s cooperation prolongs and strengthens the Mueller investigation. Trump’s friendly TV lawyer Alan Derschowitz even says it’s a big win for Mueller, because he can ask new questions, perhaps about the Republican party platform, the Trump tower meeting with Don Jr and Jared Kushner, and Trump’s possible obstruction of justice. Manafort must testify on any subject Mueller finds relevant. And federal prosecutors will typically not agree to the cooperation unless the person talks about all crimes they have committed. The cooperator can’t cherry pick information. They must cooperate with prosecutor with whatever the govt deems relevant. As for credibility, Mueller is money. Speaking of money, Mueller’s in the black. His investigation has now paid for itself with money to spare. Mueller probably received valuable information from Manafort, otherwise he wouldn’t have offered a deal. Since Mueller was going to win the case in DC, he had no reason to ask for Manafort’s cooperation unless he was getting something in return. But that doesn’t necessarily mean Trump is the target for Mueller. There might be people other than the president that Manafort could point his finger at. After all, this Manafort guy is Shady McShaderson. I mean, the sheer number of people he is tied to (on both sides of the political isle), and the range of his crimes are enormous. It may be possible that Mueller just wants to end this criminal conspiracy, even if it doesn’t involve Trump, and the best way to do that is to get Manafort’s cooperation. I think it would be worth it. Now I understand why Mueller’s investigation is taking so long. Every time he pokes at the ceiling, another rat falls from the dropped tiles. Everybody involved is fishy. If Trump and his family are totally innocent of any wrongdoing, then it appears to me they’re the only ones in Washington who are.